I first met Dr. Gimmler and her staff in February. We were referred when, after months of trying everything, my sweet Chloe was only getting worse. 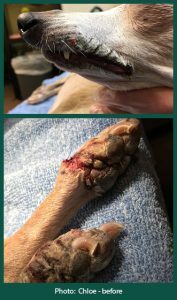 She was covered in open lesions, couldn’t eat, and she was in so much pain she could barely walk. Right away Dr. Gimmler was sure she knew what was going on, and ran tests that same day that confirmed Chloe did have Hepatocutaneous Syndrome. This rare liver disease is incurable and has a pretty grim outlook-however, Dr. Gimmler never let us go down that path. Instead, she saved us. She has a formula. 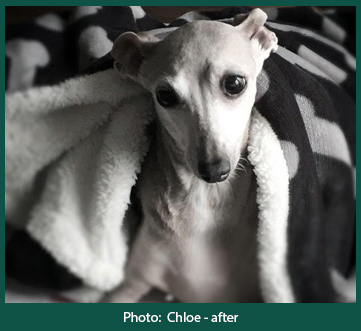 I have followed every instruction and suggestion of the plan she laid out for Chloe: the infusion treatments, vitamin supplements, “a special chicken stock” . . .in just 2 months time, I am amazed by how well Chloe is doing. She has no sores, she has NO PAIN, her appetite is back, and she has more energy now than she ever had! I believe Dr. Gimmler described it as “miraculous”. Dr. Gimmler, Leah, and her entire team are full of patience, compassion, and lots of Kleenex, but it is their positivity really sets them apart. I know Chloe wouldn’t be here without Dr. Gimmler. This disease is so rare that it is often never diagnosed, or it’s too late. With this amazing team we have been given hope of actually having a future with Chloe. How do you thank someone for that? I am truly their biggest fan!